Dad's official Army Air Force publicity shot on the occasion of his first Japanese air-to-air kill, dated June 12, 1945. The aircraft is a republic P-47D-23 thunderbolt. The badge under the cockpit is one of many variations of the 333rd Fighter Squadron's "Coral Cobra" emblem. 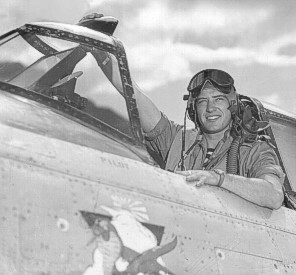 Lt. John H. Payne, Jr. ("Jack"), flew Republic P-47 Thunderbolts during World War Two. His primary combat experience was in the Pacific. I grew up listening to his war stories and tales of death-defying adventures. When I was a kid, I wanted to be a WWII fighter pilot, but I eventually realized that, barring time travel, that wasn't gonna happen. But I can still capture the romance (what romance there was) in plastic. Here's a brief rundown on the planes Dad flew. Before heading out into the Pacific war zone, Dad spent a few weeks standing guard on Hawaii. Assigned to the 468th FS, 508th FG, he flew a bare metal P-47D named "Jack the Ripper." Click picture for details 1. "Jack The Ripper"
The second plane that I know he flew was "Big Squaw," an olive green and gray P-47D-15 of the 19th Fighter Squadron. "Squaw" was normally assigned to Captain John Vogt, but Dad flew her a number of times. Click picture for details 2. "Big Squaw"
Republic P-47D Thunderbolt, 19th FS, 318th FG, 43-25327, Saipan, Marianas Islands. The 318th moved to Ie Shima, a tiny island off the northeast edge of Okinawa, in mid-May 1945. They also upgraded their equipment to the long range P-47N Thunderbolt. Their mission was to fly Very Long Range (VLR) strike missions against the southern islands of the Japanese homeland itself. He named his plane "Icky and Me." Click picture for details 3. "Icky and Me"
After the war, in the 1950s, Dad got himself a nifty little 1939 Piper J3 Cub, and, with his friend Paul Nielson, started an aerial photography business. Dad flew, and Paul took pictures hanging out of the open door with a very large aerial camera. For years everybody at Lincoln Park Airport knew the little blue "Photo Cub."